This product works miracles on white surface scratches. Simply rub the stick along the scratch and it disappears! Will not damage the finish, making it ideal for antiques, pianos and fine furniture. Works with all types of wood. Not recommended for gouges, deep scratches or for use on bleached surfaces. Includes one 1" x 2-7/8" stick packaged in a metal can.Can't spill or break. Easily repairs over 1000 scratches. If the surface appears too shiny after using, wipe with a dry cloth. Will not damage the finish making it ideal for antiques pianos and fine furniture. 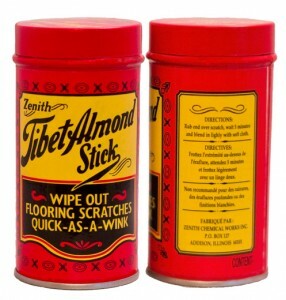 The Tibet Almond Stick is a tightly rolled cotton stick, soaked in a secret family formula. It is used to efface surface scratches from wood surfaces. Click the button below to add the Zenith Tibet Almond Stick to your wish list.